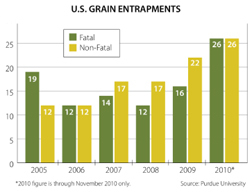 Injuries and fatalities involving entry into grain bins and other grain storage facilities reached new highs in 2010 – with 52 cases being reported nationwide through November 2010, half of which ended with a fatality (see chart, below). Of those 52 cases, 35 occurred on farms. Kelly Brunkhorst, director of research for the Nebraska Corn Board, said the numbers, compiled by Purdue University, are alarming because they are the highest recorded in a single year by the researchers at Purdue. Horizontally crusted grain is like a bridge and can collapse and immediately bury farmers walking across the top of it. The collapse of crusted grain on the side of a bin is like an avalanche that can break bones or bury workers. “People can suffocate with only 12 inches of grain covering them because the weight of the grain prevents movement,” Brunkhorst said. To alert farmers to this important issue, the Nebraska Corn Board’s “CornsTALK” newsletter features a cover story on grain entrapment, including the types of engulfment and contributing factors. It notes that a lot of farmers store grain on their farms. Nebraska, for example, has an on-farm grain storage capacity of 1.1 billion bushels. Capacity nationwide is 12.5 billion bushels and expanding every year. The newsletter can be downloaded under the media and publications tab at http://www.NebraskaCorn.org. In addition, the National Corn Growers Association has produced a video in conjunction with the National Grain and Feed Foundation that talks about the hazards of flowing and lodged grain. It also discusses how an engulfment can impact a family and farm operation. The video can be viewed at NCGA’s website at http://bit.ly/erOwFd).